What Ever Happened to 2m FM? My first 2m FM rig was the Icom IC-230, like this one. I was reading an article in a recent issue of QST, talking about the rise of FM in amateur use, and it dawned on me. It's been nearly 10 years since I had a VHF FM radio in the car. 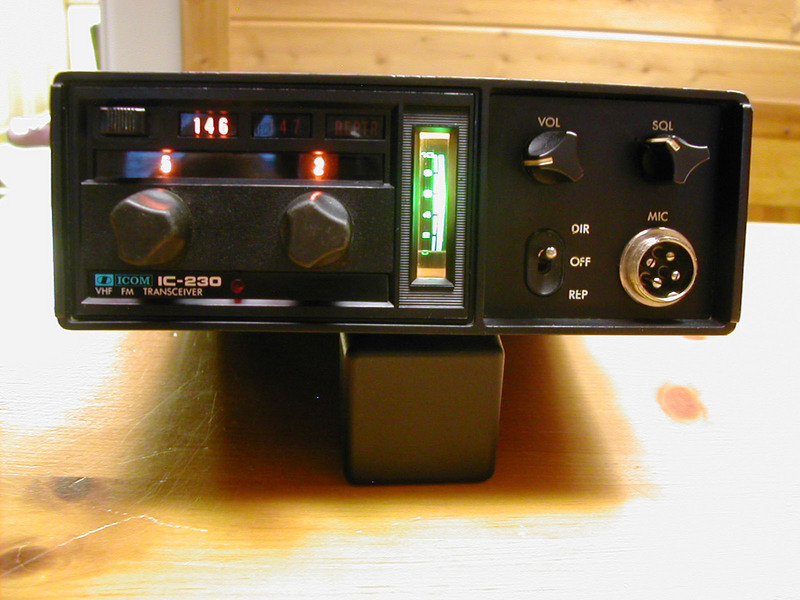 Thirty-five years ago, in September of 1979, I got my first 2m rig -- an Icom IC-230. My brother Ben, now NJ8J, had gotten a 2m handheld several months before. While home before college, I noticed how much fun he was having on 2m, and I wanted to be part of it as well. One of his 2m contacts, a gentlemen whose call I have forgotten, had a Icom IC-230 for sale, and the price was reasonable for my college-bound budget. Ben and I went out to his house and came home with the rig. I fashioned a 1/4-wave whip using 19" of coat-hanger wire with four copper wire radials attached to an SO-239 connector. A quick jaunt out the dormer window and the antenna was attached to the roof just above the window. That old house was in a prime spot for VHF. Right at the top of a hill, it was the highest spot for a couple of miles around. And it didn't hurt the antenna was near the top of the roof. Propagation that week of September, just before I headed for school in Georgia, was also fortuitous. There was a massive troposphere opening, and I worked FM repeaters in four or five states in just a couple of days. I don't believe I've ever experienced such an opening since then. Back in the days before frequency synthesizers, the IC-230 was an ingenious design. It used about 18 different crystals in a mixing arrangement that allowed it to generate all 67 of the 30 kHz spaced channels from 146.01 through 147.99, plus the standard repeater offsets of +/- 600 kHz. Ingenious as it was, this arrangement was obsolete by the time I purchased it. The 2m band had expanded to allow repeater operation in the 144 and 145 MHz sections of the band, and some repeaters were operating on the 15 kHz splinter frequencies, which the IC-230 couldn't access. The rig did have provisions for adding three extra crystals to generate oddball repeater frequencies, as well as a switch position for an external digital VFO. On my college budget, I never could afford these options. Even so, I could generally find plenty of activity on the main 30 kHz channels. Somewhere along the line, I bought a car, and of course I put the IC-230 in it. My antenna was a home-brew magnet mount made out of a tuna can with a plastic lid, a phono connector with a 19" curved copper wire sticking out of it. Not sure where I got the magnets, but they were strong enough to hold it in place. While the IC-230 was sold long ago, I still have this home-brew mag-mount. Driving around downtown Atlanta, I often heard other hams complain about intermod from the other VHF signals and the tall buildings. Not with the IC-230. The designers put five helical resonators in the front end to pass the 146-148 MHz signals. Those resonators were like a brick wall to out-of-band VHF signals. In downtown Atlanta, I might hear some picket-fencing, but never any intermod. That's the one feature of that rig I miss. I eventually traded in the IC-230. I had a Heathkit HW-2036 for a while. I also bought several hand-held transceivers. Today, I have an Alinco DR-570 as well as an old Yaesu FT-227RA Memorizer. Neither of these rigs has seen the inside of a car in over 10 years. I wrote back in May that my 80/40m dipole had fallen down when a tree branch broke off and came through the antenna. While there was no real damage, it did dislodge the rope anchor I had cast over the tree. Because it is so difficult to cast a line into the trees when the foliage is out, I had to wait. It was fortunate, however, that I did wait. During the summer storms, this same tree shed a couple more large branches. Well, the leaves have thinned out considerably from the trees, and I've actually been out in the woods a couple of times to cast a new line. Those sessions didn't end well. You see, I'd go out with a weight made of a 1/4 to 3/8" bolt and a few nuts, and on the first cast, I'd lose them. They came sailing off the end of the line, never to be found. As I wrote about the Mark III Antenna Launcher, losing weights is inevitable. Given the beautiful fall weather we had this weekend, I decided I was not going to have my antenna raising session interrupted by a single lost weight. Normally, I'd recommend you construct these antenna weights with hardware you're not likely to use for anything else. This likely means old, corroded nuts and bolts that you've taken off some old assembly. However, I did not have much of this kind of hardware on hand at the Micro-Shack. Time to fight back with numbers. A quick trip to the local home improvement store found 100 1/4" nuts and a dozen 1 1/2" long 1/4" bolts for about $8. The plan was to jam on as many nuts as the bolt would allow. This would make for a reasonably heavy weight, but one that would fit well in the slingshot pouch. Assembly is easy. 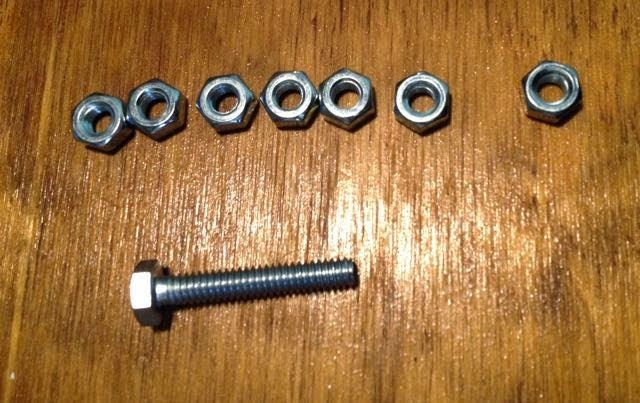 Simply screw the nuts on to the bolt as far as they will go, and repeat. 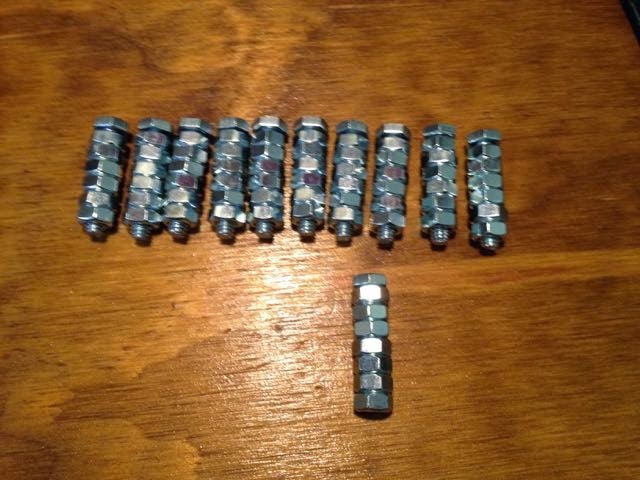 I managed to get six nuts on the 1 1/2" bolts, although I did have one overachiever bolt that received seven. 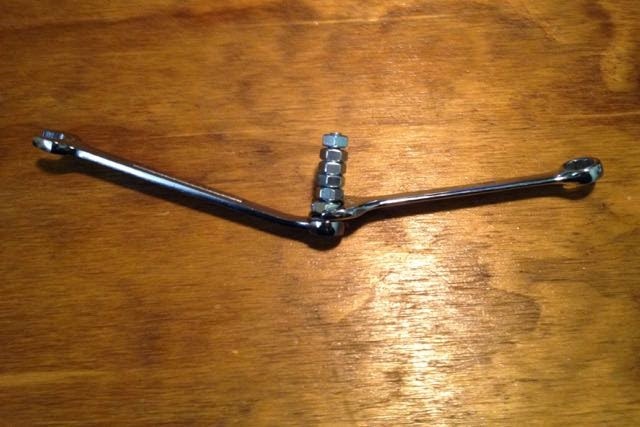 Once the nuts are on the bolt, but loose, take a couple of wrenches and jam them down on the end of the bolt, and then one against the other. Make them tight enough that they won't go flying off when launched into the air. Less than 20 minutes later, I had a dozen antenna weights. Filled with confidence, I marched outside fully prepared to lose numerous weights in order to get the dipole in the air. Naturally, given my readiness for sacrifice, I managed to get the line over the tree branch on the first shot. I didn't lose a single weight. Well. I am now prepared for the mid-winter antenna raising season. I am very happy to have this dipole back up. I have missed it all summer.